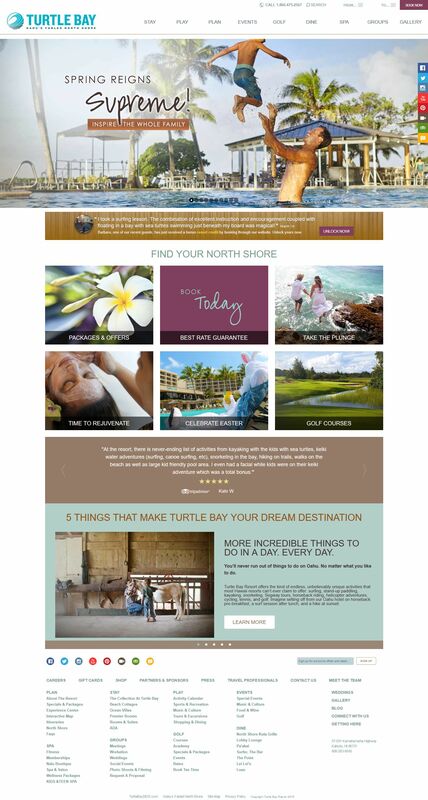 Turtle Bay Resort is an upscale hotel in Oahu running Drupal. Drupal, while an excellent CMS, can be a bit difficult to manage and update comparative to other content management systems. When Turtle Bay began having problems with their Google Analytics e-commerce reports, they turned to Sandia Digital for help. Sandia Digital began investigating the custom Drupal theme that was set up for Turtle Bay. Within the header, we found Google Analytics alongside Google Tag Manager. This was interesting, as there were several elements of the Tag Manager that did not make sense. We took a look within Turtle Bay’s Google Analytics account and found that their referral exclusion list did not include the third-party booking site or their own domain. We also found that a custom tag was improperly implemented within the Google Tag Manager area. These issues lead to the loss of transactions tracked by Turtle Bay for several months, but just after a couple of weeks of investigation and correction, all e-commerce traffic is accurately tracked by Google Analytics.